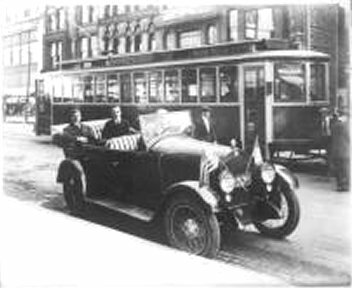 President De Valera on tour in Indiana, circa 1920 (Notre Dame Archive). Times-Union of Jacksonville senior writer Bill Foley. Sunday, March 22, 1998. It wasn't always shamrocks and leprechauns. Nor Luck, Be a Lady Tonight. St. Patrick's Day 1920 found strife in Ireland, turmoil in America, sin on a roll and a ruckus in Jacksonville. Eamon de Valera, himself, was coming to River City. Those who cared, one way or the other, split into rival camps. De Valera was the president of the Irish republic, to those who believed in such a thing. To those who did not, such as the British government and those who esteemed it, de Valera was an upstart rebel just a feather away from being an anarchist, and a papist besides. Both factions were in full flower with the coming of the Irish chief to Jacksonville. The nation was busting a gut after World War I.
Flaming youth was charging blazes-bent into the Roaring '20s. The Feds were busting commies. The cops were chasing robbers. Bathtub gin was catching on. Women were bobbing their hair. Sin was having a field day. Into the roiling springtime came de Valera to America to free Ireland and Rheba Crawford to Jacksonville to fight sin. On April 4 at the Lexington Hotel in New York, 3,500 Irish-Americans strained to comprehend every Gaelic word of the lean leader on the lam. Word flashed like magic to Jacksonville that Dev was coming to our sleepy Southern city. Not surprisingly, a tizzy ensued. ''Not Our Affair!'' screamed the local chapter of the America First Association, even before the Duval Theater could post bills proclaiming the imminent appearance of the president of the Irish republic. ''Ireland is not on the map of the United States,'' said the America Firsters in ads in The Florida Times-Union and Florida Metropolis. ''The people of Jacksonville and all 100 percent Americans have their hands full attending to their own business.'' There was a case for their contention, of course, however spurious it appeared to the Irish in America. De Valera had commanded the last battalion to surrender in the Easter Rising of 1916. He had transcended a death sentence and a life prison term; he was at the present an escapee from detention for alleged complicity with the Germans. He had arrived in America a stowaway and was in the process of raising $6 million for the cause of Irish freedom. How much of the $6 million he raised in Jacksonville, a land stranger to him than the Nine Pins, is not a matter of record. Nor is Rheba Crawford's take. Rheba was as familiar to Jacksonville as de Valera was exotic. You could call her Rheba for she was but a winsome lass they said was only 22 years old. You also could call her ''captain,'' for that was the rank she had attained in the Salvation Army. Everybody in Jacksonville knew her; seemed she had been around town forever, singing on street corners since she was small enough to stand on the drum, brushing Bibles with Aimee Semple McPherson before the war. But Rheba was best known now for banging a tambourine on Broadway in New York City and raising a ton of money for war bonds. That is how she got to be captain and high-ante spokesperson against sin. The Captain and the President would speak back-to-back on succeeding nights, she at the Duval County Armory, he at the Duval Theater. A 25-piece splendidly equipped band heralded the winsome lassie. Bishop M.J. Curley of the Diocese of St. Augustine welcomed the Irish leader. About 600 turned out for captain. The Duval Theater was packed for the president. The captain spoke at a podium winsomely alone, of fallen women and their redemption. The president spoke on a crowded stage of an Ireland once and future free. At his side were Maj. J.M. Kelley of the American Legion and New York's famous Irish Fighting 69th, Belfast Presbyterian minister J.A.H. Irvin and Jacksonville Friends of Irish Freedom - the Rev. Michael Maher of Immaculate Conception Catholic Church, P.A. Holt, the Rev. W.H. Hiller, Ben Burbridge, J.D. Burbridge, A.N. O'Keefe and John Crowley. The Irish evening ended after midnight with The Star-Spangled Banner and a hip-hip-hooray for Ireland and its president. And then De Valera was gone, into a night stranger than Nine Pins. The two passing speakers that long-ago April would go on into history in disparate ways. De Valera would be the dominant figure in Irish history until his death in 1975. Rheba Crawford would become Damon Runyan's inspiration for Sister Sarah in Guys and Dolls.